Cushioning is a key part of what shoes do during a workout, and good athletic socks can help. Especially if you’re a runner, the best running socks have a thicker, shock absorbing bottom. While you’ll probably want to wear lighter socks during competition, thicker varieties of the best running socks provide much more shock absorption. When combined with proper footwear this plays a role in preventing overuse injuries such as stress fractures. Buying new socks? Put down the cotton. Ever been paralyzed by the sheer number of choices you have when shopping for sports-specific shoes? We can’t simplify your shoe buying experience, but we can offer you some solid advice on socks. They’re the other half of what you put on your feet, and they’re something many athletes ignore entirely. It’s no secret that athletes face many foot problems, ranging from blisters to broken bones. Shoes provide protection, support, shock absorption, and moisture control. In short, they’re essential and can greatly reduce the risk of many foot problems. What’s not generally acknowledged is the role of socks. While not as critical as shoes, the best running socks provide many of the same functions. How about material for the best running socks? The three main choices are cotton, wool, and several types of synthetic fabric. It’s true that cotton “sweat socks” have been the traditional choice for generations of athletes. Today, however, synthetic fabrics are generally superior and almost always the better choice. But what about wool? While wool is certainly no high-tech synthetic it often performs just as well. Cotton socks, especially well-worn pairs, have a tendency to bunch up in places. This is almost entirely avoidable by ditching cotton in favor of other materials. This isn’t just a comfort issue. Bunched up material doesn’t offer even, uniform protection against friction and abrasion. This can make a difference in any sport, but is especially important to distance runners. Cotton also falls short in moisture protection, often referred to as wicking. The long, absorbent fibers found in cotton act as tiny sponges. They not only won’t keep your feet dry, but will actively hold sweat against the skin. Synthetic fibers absorb moisture too, but carry it away from the skin via a “wicking” effect. Note that wool provides this function just as well. While you’ll certainly pay less for cotton, it’s best to go with 100% acrylic or a good synthetic blend. They’ll cost more up front, but will hold their shape and usually last much longer. They’ll also help you stay dry, provide better cushioning, and repel odor. · High quality socks are especially important to runners: Bunched up, soggy cotton socks certainly won’t add to one of your longer runs. They’ll also hold moisture against your feet which can greatly increase your chances of athlete’s foot (tinea pedis). They can also contribute to fungal infections of the toenails (onychomycosis). · The same applies to hiking: while synthetic socks are a good option, many veteran hikers prefer wool. This natural fiber provides good wicking and an unmatched cushioning effect. What’s more, wool is one of the few materials which hold in heat when wet. It’s also naturally odor resistant. Wool is an excellent overall choice, especially for cold temperature hikes. · Cycling: thin synthetic socks are probably your best bet. They weigh virtually nothing and efficiently wick away moisture. Synthetic cycling socks often have a slippery feel as well, which can reduce friction and chafing. · Lifting: sock material isn’t as important for strength training. Many trainers recommend wearing socks which cover the shins, however. This can prevent scrapes and bruises when performing bar exercises such as dead lifts. Regardless of what you’re buying socks for, don’t go cheap. Choose a high quality acrylic, synthetic blend, or wool sock. These options will not only last longer, but your feet will thank you! As a group, no one suffers more foot problems than individuals with diabetes. In light of this, many podiatrists prescribe diabetic socks. When used consistently, they offer several health benefits which can greatly contribute to overall foot health. There’s really no downside to wearing diabetic socks, and according to podiatrists most diabetics should wear them. 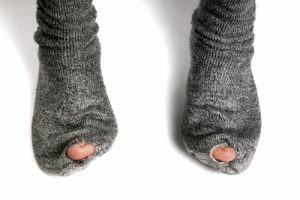 If minor blistering occurs from socks that are too tight the answer is simple—get larger socks. If larger irritations or even small ulcers begin to appear tell your podiatrist immediately. Almost anything can be bought online today, and diabetic socks are no exception. While it is possible to get good deals at medical supply stores, shopping online is usually your best bet. Prices are generally lower, they’re delivered right to your door, and the selection can’t be beat. Amazon.com is a great place to start. This online mega-retailer allows 3rd party companies to sell directly to you, eliminating the middle-man. All of these manufacturers are competing for your business as well, and this pricing war definitely works in your favor. If you prefer to try before you buy the answer is simple. First, find a pair you like at a bricks and mortar retailer. If you’re fully satisfied, buy them online next time. Amazon also features user reviews. These aren’t paid ads, and can help you greatly in the decision making process. This is something you simply can’t get at a physical retail location. It’s also one of the main reasons millions of people prefer to shop online. Still not done shopping? Hundreds of other sites which are competing with Amazon are just a click away. Take 10 minutes to check out a few more retailers and you may find an even better deal. The nursing profession presents special challenges which make compression garments almost mandatory. Very long shifts standing on hard surfaces, combined with long periods of sitting, are the norm for most nurses. Experiencing symptoms such as achiness and heaviness of the legs, fatigue, and swelling is almost a given. This being said, it’s a good idea for most (if not all) nurses to wear compression socks. They provide symptomatic relief, reduce lactic acid buildup, and help bring oxygenated blood back into the legs. Over time, wearing good compression socks can prevent these hardworking health care professionals from developing unsightly varicose and spider veins. It’s a simple solution, and many nurses who didn’t wear compression socks early in their careers reach a point where they wish they had. If you’re a nurse, high quality compression socks are a great way to tell your legs you love them!